Suffering from allergies is never a pleasant experience to endure. However, Gesundheit proves that being highly prone to allergic reactions can have its upside. Konami Digital Entertainment, Inc has teamed up with independent games studio Revolution Concepts to produce Gesundheit, a beautifully animated and designed game based on the concept work of film and television animator Matt Hammill. Available for both iPhone and iPad, Gesundheit spans across forty levels, offering a huge amount of gameplay from such a seemingly simple title. 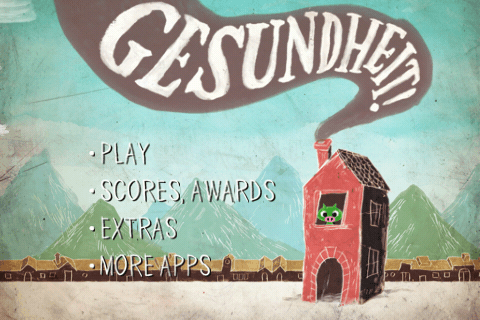 Gesundheit is at heart a point and tap puzzle based game. Featuring four worlds, each with ten levels, the game has enough to keep you busy for a long time. Each world needs to be entered through a gate, which in turn requires stars to open. Star fruits are collected in each level, with each world having three possible fruits for your little piggy to collect, and hopefully not eat. The only problem is, monsters plague the worlds the little pig must get through. As if his allergies weren’t enough of a burden! 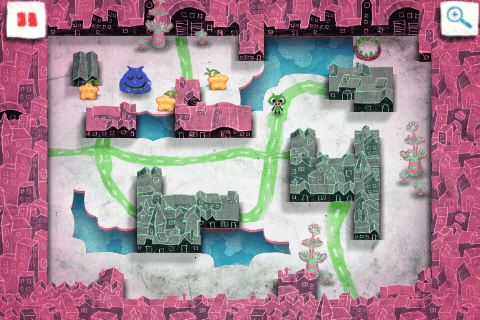 There are traps that you must lure the monsters into in order to complete the level. Thankfully your allergies come in handy and can be utilised as a kind of weapon. For some reason these monsters love to eat snot, and will gladly wander into traps for a free meal. As you progress, there are new abilities you utilise in your quest, like shooting giant snot balls, or sling shotting yourself across wide gaps with a sticky string of shot. 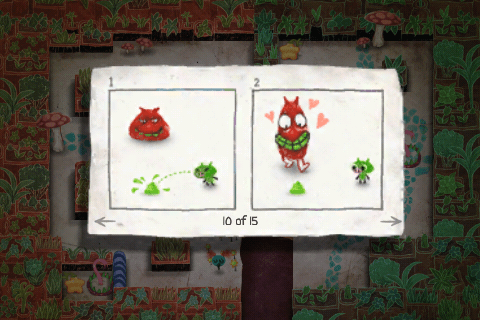 While it sounds all too simple to point and tap, Gesundheit is a fairly difficult game to pick up. 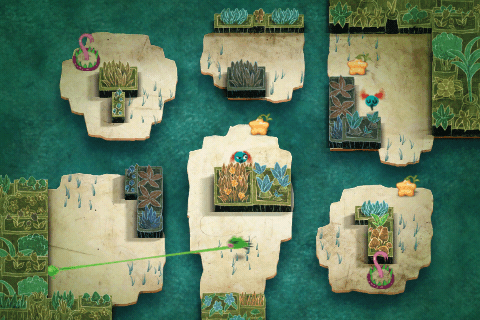 Many of the levels involve strategically hiding around corners and bouncing boogers off walls in order to outsmart enemies. Luckily you can skip levels if they become too taxing, but you will eventually run into problems getting through gates to the next world if you consistently do this. In all honesty, the gameplay isn’t all too innovative. While the level design makes for great fun I really think the game is driven by the graphics, which are nothing short of breathtaking. The art is based on concepts by film and television animator Matt Hammill, featuring some incredible hand drawn style characters and levels. The construction of the world is completely captivating: from roughly drawn world maps to complete and complex maze like levels featuring spectacular artwork. I can’t help but feel somewhat reminiscent of educational animations from when I was a child, only of a much higher quality. 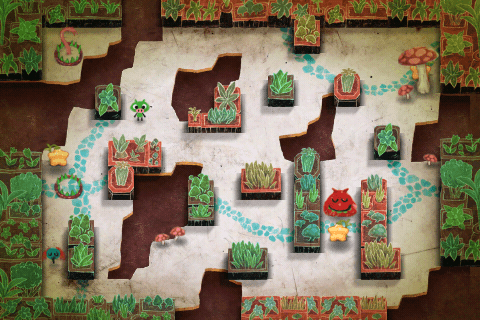 Quirky colour choices, hand drawn style sceneries that are slightly off model add a layer of charm to Gesundheit that is very rare to find in games, especially for iOS titles. It’s the artwork, and I stress artwork, not merely graphics, that really push this game forward for me. I can’t help but become completely engrossed by this pocket sized world and its lovable, yet often evil, characters. Given my love for the visual side of Gesundheit; it may be no surprise that I find the audio not only fitting but also completely amazing in its own right. The sound effects fit with the charming visual style of the game like a glove. Large exhales that continue until your character runs out of breath, little ‘boings’ when the boogers bounce from the walls, and not to mention angry growls when your enemies catch you in their sights, give so much life to the already beautifully designed characters. The sound effects are also used really well to create an extra dimension to the game. When characters walk around, little footsteps that sound like they are walking across a pebbled path come from the speakers. Furthermore, in the world maps chirping birds and ocean sounds (depending on the world) add a much-appreciated extra element to the game world. Gesundheit also features an upbeat, well-composed soundtrack that is a delight to listen to throughout each level. Playing Gesundheit has been nothing sort of a treat. The simplistic gameplay allows you to sit back and appreciate the design of the game, which I must reiterate, is spectacular. However, if you’re not so much into games with this unique visual or audio style, then I still think the gameplay is enough to carry you through. The levels increase in complexity, as more monsters appear the further in you get, and with forty levels to make your way through you won’t feel the sting of repetition any time soon. Konami have done well to hitch their wagon to Revolution Concepts and animator Matt Hammill to produce such a fantastic title for iOS devices.